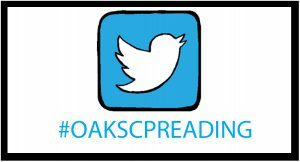 At The Oaks, we are passionate about reading and enthusiastically spreading a love of and enjoyment of reading and books. Children at The Oaks participate in regular whole class interactive shared reading sessions focused on enhancing pupil enjoyment of reading and deepening pupil understanding. 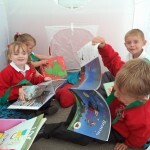 The school adopt Talk 4 Reading to provide a structure and sequence to shared reading. The organisation of the reading session is adapted to suit the age of the children. In the reading sessions the teacher does the reading and uses skilful questioning to employ and develop pupil comprehension. During shared reading pupils are involved in lots of discussion and book talk linked to quality chosen texts and are given opportunity to practice and develop specific reading strategies. In addition, in Year 1 pupils participate in an additional group reading session with the class teacher and in Year 2 pupils participate in additional reading skills focused sessions with the class teacher. All pupils across the school are given opportunities to read for pleasure and read their own choice of text including storybooks, poetry, magazines, comics and newspapers. Some pupils also receive 1:1 reading using the Better Reading Partnership programme – children read 3 texts (sections or extracts of larger texts) within a session. The 1:1 sessions focus on building pupil confidence in their own ability as a reader, increasing fluency and developing comprehension. Some pupils also follow the Reading Wise programme focused on decoding and building fluency. Pupils in KS1 also participate in daily phonics sessions focused on word recognition – more information can be found on our phonics page. Children take home 2 reading books – 1 book to match their reading level or age and one book chosen for pleasure. Trained Beanstalk reading volunteers visit school twice a week to read with children and to boost pupil reading confidence. To support all of the reading in school and to ensure pupils become fluent efficient readers, the school have created its own set of reading strategies. Take a look at the document to help support your child with reading at home – the link to the document is at the top of this page. Happy reading! Look out for our next Extreme reading challenge! Don’t forget to encourage your child to read as much as possible and achieve their 50 or 100 reads! The school cur rently use a range of different books to deliver its reading including: Rigby Star, Rigby Rocket, Bug Club, Oxford Reading Tree and Rapid. These books help the children to build on the phonics work that they do in class every day. Reading is taught through: shared, guided and individual reading sessions. Children also bring home a reading book alongside their reading record each night. We ask that you try to read with your child each night and fill in their reading record letting us know how they have got on and any words they may have needed support with. 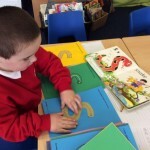 The school also uses ‘Phonics Play’ to support in delivering Phonics throughout the school. Our phonics sessions are taught daily for 30 minutes with the first 10 minutes focussing on handwriting and the application of writing and the last 20 minutes focussing on the revisiting, teaching and application of reading.